The first question everyone asks when you have a new baby is “Are you getting any sleep?” As first time parents, we really have no idea what we are doing most of the time, but I did know I wanted to have a some kind of plan when it came to a night time routine for sleeping. Well I did not take a single baby class and I didn’t read hardly any books, so I was off to a great start. The three books/programs that I did read and follow a bit were “Moms on Call”, Babywise, and Taking Cara Babies (on Instagram) and I think the routine we ended up with was kind of a combination of parts from all those programs. We don’t rock to sleep: This sounds harsh, but hear me out. It is so important to put your baby down to sleep while they are still awake. This way they learn to put themselves to sleep and don’t rely on you to help them go to sleep. We may rock JW a little bit after finishing his last bottle of the day, but not long enough that he falls asleep, just enough to get settled down and so he knows it’s time for bed. This also benefits them if they wake up in the middle of the night because they don’t immediately cry and panic, but instead know how to self soothe and put themselves back to sleep. We stick to the routine every. single. night: Not every night is perfect. Sometimes he’s fussy or doesn’t feel good, but we always do the exact same routine and we never give in. JW has slept in his nursery, in his bassinet, since the first day we came home from the hospital and we have never even considered anything different. We always do the exact same routine, in the exact same order (I’ll outline exactly what that is below) and even at 3 months old he’s becoming familiar with the routine and knows what to expect. Below I’ve listed our basic step by step routine that we follow every night. As I said at the beginning of this post, I’m definitely not an expert, but this is what has worked for us so far and we plan to keep it up. I think it’s always helpful to hear other people’s routines and methods, and while you may not do everything exactly like us, maybe little parts and pieces of this will be helpful! There are specific items we use at bedtime that I mention in the routine, like our sound machine, swaddle, etc., and I did a whole other post with details and shopping links to those here. Lights out except for nightlight or lamp: We start by turning all lights out except for a small lamp that is on his changing table (you could also use a nightlight instead of a lamp). This makes the room dark enough that he knows it’s bedtime but also gives us enough light to see while we finish feeding and changing him. Sound machine and diffuser on: We turn the sound machine on the white noise sound on the highest volume possible and turn on an essential oil diffuser with some lavender, eucalyptus, and peppermint (find our exact diffuser and sound machine here). Diaper change and change into short sleeve onesie: We do a final diaper change and put on a short sleeve onesie for bed, but don’t put his swaddle on until after he finishes his last feeding. Last feeding in room: We always do the last feeding in his room with the sound machine on and lights off. Owlet on and swaddle on: After finishing feeding, and burping, we put the owlet sock on his foot and zip him up in his swaddle (with arms inside). You can find more details about the exact swaddle we use and how the owlet sock works here. Paci in and rock for just a minute or so: I turn the lamp out right after I put the paci in his mouth then either sit down to rock him or just rock him in my arms a few times and lay him right down. 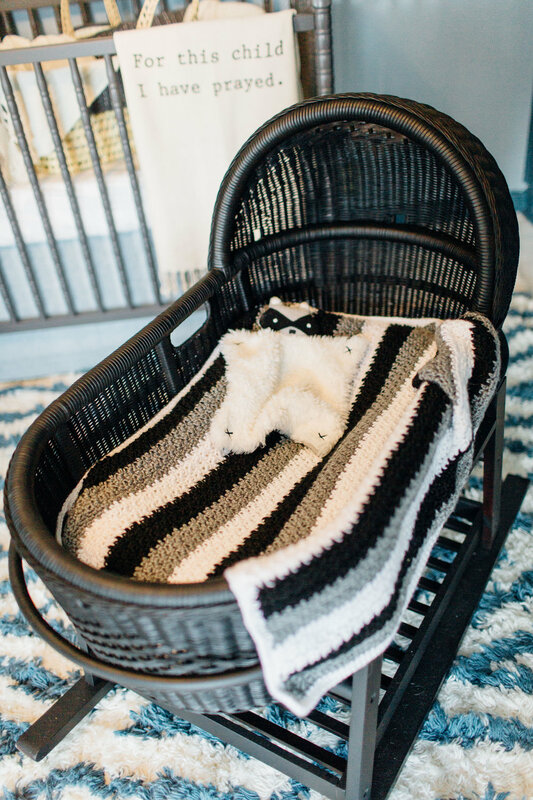 Lay in bassinet or crib and make sure paci is still in: We are still using a bassinet with the snuggle me lounger inside (more details on that here). He usually closes his eyes and goes right to sleep after being laid down. Leave room quietly: I tiptoe out and try not to stub my toe or run into a wall on my way out! If baby wakes up in the night: We go in without turning on lights, talking, or saying anything, put the paci back in his mouth, maybe rock the bassinet a few times, and leave. At first you may have to do this a couple times in a row, but eventually your baby will learn to go back to sleep on their own and know that you aren’t getting them up. We do not ever pick the baby up out of the crib/bassinet unless we’ve tried the above at least 2-4 times. If he continues to cry after that, usually he needs a diaper change or to be fed (especially when they are younger). If we do need to feed or change diaper, we do it the exact same way we did the bedtime routine before so he’s be ready to go back to sleep right after and knows it’s still not time to get up. Get all the details on my bedtime baby necessities and shop them here. Find more baby related posts here.